One thing that has always bothered me about Online Appliance Repair is inaccuracy. Here's what I'm talking about. Let's say you have a Maytag Washer that's not spinning. That's simple to find on the internet right? Of course it is. Maybe you will read the post about the guy who replaced the spin board. That took care of his problem. Go ahead and order one and stick it on your machine. Did it start spinning again? Probably not, here's what happen. You and the guy you read about didn't have the same problem. Maybe it was just your lid switch. Did your belt break? Is the Motor Bad? Is the timer not sending out the correct signal to the control board? Who knows, any one of those parts will cause your Maytag Neptune to not go into the spin cycle. Of course doing your research on the computer is helpful in finding all the different repairs that were done on your type of machine, but you need to know what you need to do to fix YOUR machine. That's when the factory service manual comes in handy. The Repair Manual for your Appliance is the best knowledge about your machine that you could possibly have. One simple reason why, that's what the Appliance Technicians use when they have trouble. Come on now. Maytag Neptune Washers can be run in diagnostics mode to point you in the right direction so you know which parts to check first. Just remember that when one thing isn't working on your washer, there are a number of parts that work together to make the whole process happen. The Manual will have more pictures than you know what to do with. 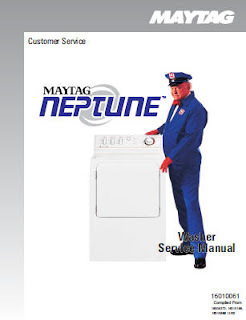 Every part of the Washer is covered in the Maytag Neptune Repair Manual. There is alot that can go wrong with these washers so it would be a waste of time and money to guess at which part you need to replace to repair it. Fix it right the first time, correctly. Another good thing about the Repair Manual is, once you download it to your computer, it's easy to find. That way the next time you have a problem with your washer, you have ALL the information you will need in one place and you don't have to wait for someone to reply back to your post. Having the manual around is alot cheaper than having a service guy out to your house to do what you are more than likely capable of doing yourself. Once Payment is made you will get an email with the link to download and save the manual to your computer. If your Maytag Neptune front loader has a timer knob (non digital) you need to check to see if you have the 12002535 faulty door latch wax motor. See http://www.neptunehelpsong.com for a video that explains what happens. You can proactively change your wax motor before it damages your neptune's control board and your clothes will not spin and be soakin wet when the wash cycle is complete. Get help from a professional appliance repair company in Los Angeles by EZ Appliance RepairAppliance Repair services in Los Angeles at (800)350-0224. Repairment must be done from the professionals.Most of the plumbing and heating service Experts can tackle these type of problems.If person can able to understand easily then it is good to use it own.